A week that started with the release of the EC's excellent Hinkley document went from strength to strength with Tim Yeo's deselection. Huhne, McShane, Yeo, Hinkley - the gods really are sweeping up. Even the loss to France in Paris on Sunday doesn't take the shine off this. So - to business. As noted before, the EC's 70-pager on the State Aid aspects of the intended Hinkley nuclear power contract was sent in mid December, meaning that they were absolutely poised for the task when they received HMG's notification at the end of October. Indeed, they must almost certainly have got their thinking in order beforehand, given the depth and quality of the argumentation, and the inclusion of specially-commissioned modelling by Imperial College (no hope of EDF sponsoring any fellowships for them!) Nobody dashes this stuff off in a month. 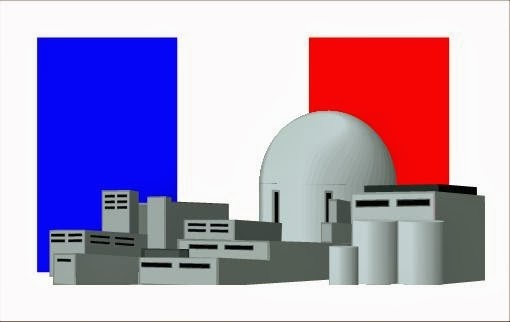 So - the first point for HMG and L'équipe de France du nucléaire is that this is no pro forma exercise as Michael Fallon, whistling frantically in the dark, has tried to portray it. Any hopes that it will end in a cheery verdict of "oh, all right then" have been dashed on the rocks of the hard-as-granite reasoning that characterises the entire opinion. I am no lawyer, but I know a piece of knock-down logic when I read it. No, the authors of this work will not be talked out of their positions, which leads to the second conclusion: only a political fix will get a ruling HMG and EDF can live with. Not that this is out of the question - hey, this is the EC we're talking about - but Cameron and 'Helmet' Hollande will need to cash in a mighty stack of political chips to get it. Now Cameron has indeed scored one significant energy goal in the corridors of Brussels this year - the overturning of the 'let's-regulate-shale-out-of-existence' bandwagon - but I can't see Hinkley being quite so easy. As to the text, if you're interested there is no substitute for reading it. The DTel had a worthy crack at summarising some key points on the day it was published - hats off to them, but overall the commentary has, as ever, been thin. (70 heavyweight pages is, after all, a bit longer than the press releases which is all journos seem to be able to digest these days.) Our friend Mr Wendland dug out one prize truffle (in the comments here) and I'll offer a couple more. "the Commission understands that the EPR technology power plants in Flamanville and Olkiluoto have been undertaken without any support. The Commission cannot at this stage explain why the [Hinkley] project should be fundamentally different from the two EPR plants currently being constructed." "it would appear to be impossible to determine at this stage whether [EDF / the project] will be overcompensated or not. The terms of the Investment Contract communicated to the Commission do not contain a correction mechanism that would take account of the effect of developments after the end of the CfD in order to ensure that no overcompensation has taken place overall." "[the contract] does not appear to be aimed at compensating a provider for the obligation to incur higher costs than it would otherwise incur. To the contrary, the measure appears to be aimed at providing incentives for the provider to invest in the project"
Failing a political fix, the most comfort the Hinkley crew can take is that the EC has pointed out what changes to the contract would be needed to have a chance of satisfying the law. Funnily enough, I'd say EDF could afford to takes those hits and carry on with the project, sadder, wiser and less cosseted. That's what it should do Whether it would, I cannot guess. I wonder if this was the same HMG that allowed Barker to claim solar panels better [value] than a pension. Did Imperial do those calculations too? He off to India to tell them the same. "According to the Department of Energy and Climate Change, the typical domestic installation costs around £4,500, compared with £13,000 in 2010"
Barker was always a major-league bullshitter! Better than a pension...until the Govt. changes the subsidy rules, then you're left with nowt. The State is not your friend; any pensioner who falls for this deserves what they will unquestionably get. Pretty much all technology drops over 2/3 in cost from the very first examples, so that doesn't seem an easy basis to use for deciding to subsidise (or not) emerging technology. The proposed CfD prices for Large Solar Photo-Voltaic are less than off-shore wind, so in that sense PV is better value for money. If you make the adjustment between 35-year CfD for nuclear and 15-year CfD for renewals we discussed last October, Large Solar Photo-Voltaic CfD prices are in fact less (£82/MWh) than Hinkley C (£92.50/MWh), and the prospect of future price drops greater. Not baseload, but somewhat aligned with the UK higher daytime power demand than nighttime, so probably useful as some proportion of the power generation mix.